I have a lot of father figures in my life that I like to honor on Father’s Day. Fathers that are friends of mine that I think do an amazing job, my imperfect father and step father, as well as mentors in my life that have played a fatherly role. This entry was posted in Cartooning, Illustration, Sketchbook Therapy and tagged Joshua B. Keyes. Bookmark the permalink. 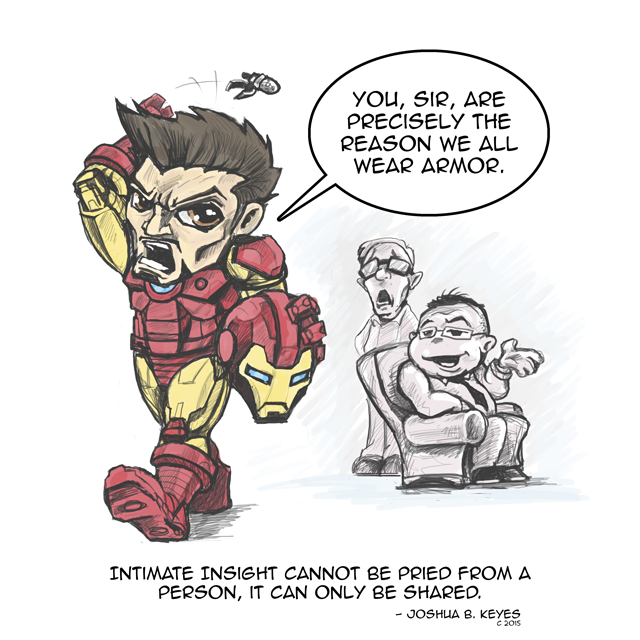 This entry was posted in Fan Art, Sketchbook, Sketchbook Therapy and tagged Crass, Ironman, Joshua B. Keyes, Nerd Feels, Personal Stories, Respect, Robert Downey Jr, Sketch Therapy. Bookmark the permalink. You might be a combat vet if you know two letters can communicate more than two books. Kind of an inside story here. Marines often say ‘Errah’ in a variety of ways. Basically, you can mean any one specific thing, or a million. It’s the the tone, pitch, texture, situation, gesture that defines the utterance of this one word . 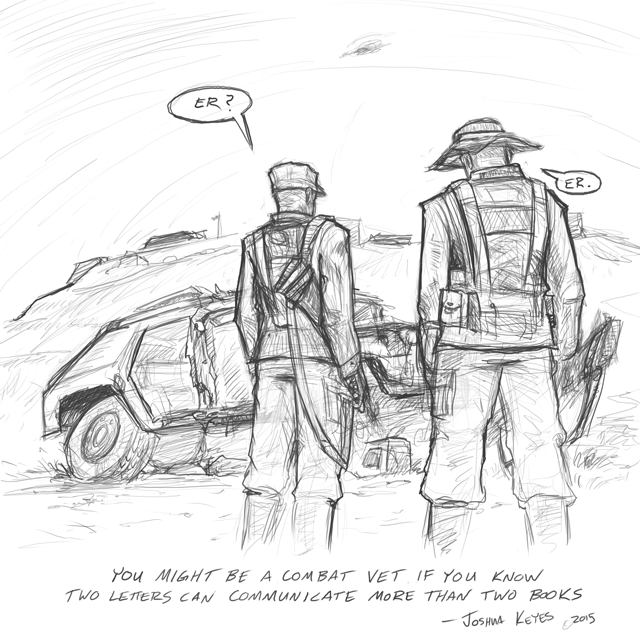 This entry was posted in Sketchbook, Sketchbook Therapy and tagged Combat, Joshua B. Keyes, Marine, Those who know, Veterans. Bookmark the permalink. This is a wallpaper I drew up after I watched the game Never vs Shuttle with Tasteless Casting. The line was so funny to me, I couldn’t help but draw it, then I decided to make it into wallpaper size. It’s a quick and rough, but it was fun. Check out more cool Tasteless quotes at the Team Liquid forums, or visit the Tasteless gaming official website. This entry was posted in Digital Painting and tagged Art, avertec intel classic, badass, Josh Keyes, Joshua B. Keyes, Joshua Keyes, never vs shuttle, piercings, pro gaming, probe, protoss, Raihn, starcraft, tasteless, tatoos, wallpaper. Bookmark the permalink. This is my first full fledged painting. It is of a still-life utilizing a limited pallet. Unfortunately someone liked it so much they stole it out of the classroom. Fortunately I had a poor photo of the painting that I attempted here to stretch and light correct to resemble the original as much as possible. Please contact me if you know anyone with this original, I would very much like to have it back, it was to be a gift to a family member. This entry was posted in Acrylic Painting and tagged Art, Bottle, Flower, Joshua, Joshua B. Keyes, Keyes, Life, Painting, Still, Wine. Bookmark the permalink. This is The Warrior’s Burden. As part of a project for my Art History class I decided to draw what I visualized a warrior of the day wearing this esteemed piece of gear. The following sketch is of the helmet itself. This entry was posted in Sketchbook Pencil and tagged Art, Art History, battle, Burden, Image, Joshua, Joshua B. Keyes, Keyes, Roman, Sketch, warrior. Bookmark the permalink.